City of Granbury, County Seat, Hood County Texas (TX) 76048; phone: 817-573-1114. Granbury City Hall is located at 116 West Bridge Street, Granbury, TX 76048; phone: 817-573-1114. Photo: Baker-Carmichael House, ca. 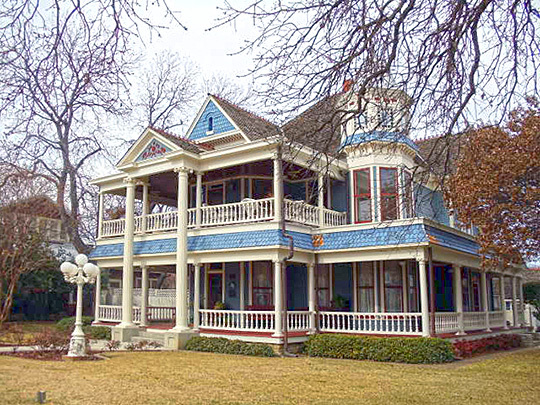 1905, 226 East Pearl Street, Granbury, TX. Designated a Texas Historic Landmark in 1996. Listed on the National Register of Historic Places in 2005. Photographed by User:Renelibrary (own work), 2012, [cc-by-3.0 (creativecommons.org/licenses/by/3.0)], via Wikimedia Commons, accessed February, 2013. Hood County was created in 1866. The Texas Legislature decreed the county seat be named after General Hiram B. Granbury, a well-known Civil War hero who led the Confederate Texas Brigade. Granbury was established when the Nutt brothers and Thomas Lambert, a settler whose home provided the main stopping place for area travelers, donated 40 acres for the site of the new courthouse and what would become downtown Granbury. The town was located along the banks of the Brazos River, amongst a heavy forest of oak, elm, pecan, and cottonwood trees. Granbury was surveyed by A.S. McCamant into 20 blocks, a portion of which is now under the waters of Lake Granbury. Each of the original 20 blocks, including the courthouse square, was 300 feet square. Two blocks extended from the courthouse square in all directions except to the west. Area streets were 40-50 feet wide on average. A large public auction was held in 1871 to sell town lots. The first Hood County Courthouse and County Jail were erected soon thereafter. A local sawmill supplied lumber for building homes by using many of the trees that existed on the original 40 acres. The town's growth and prosperity led to the incorporation of Granbury as a city in 1873. In 1887, the Fort Worth and Rio Grande Railroad was extended from Fort Worth to Granbury and provided an economic boom to the city. A college was chartered the same year. A cottonseed oil mill named The Hood County Milling Company opened for business near the railroad tracks and five cotton gins were built over the next several years. Granbury soon became the center of the county's agricultural trade. By 1895, the city's population had increased to 2000. Local legends sprang into life as Granbury became home to pioneers and adventurers. Famous outlaws such as Jesse James and John Wilkes Booth are said to have lived and worked here for a number of years. Jesse James is actually buried in the Granbury Cemetery. Davy Crockett's widow and his son Robert settled near Granbury and Crockett Street was named in honor of their family. Robert became a Hood County Commissioner, and Davy's grandson, Ashley, was Granbury's first newspaper publisher. In modern times, three major developments have contributed to the growth and economic success of Granbury. The first occurred in 1969, when the dam was built on the Brazos River to create Lake Granbury. Thirty miles of water, perfect for boating, fishing, and swimming led to the opening of four recreational parks as well as Granbury's City Beach. City of Granbury, Texas Comprehensive Plan, 2008, www.granbury.org, accessed February, 2013.